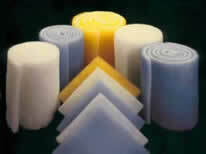 Membrane-Solutions offers a wide range of top quality air filtration available in bulks rolls and pads. Considering the unique characteristics of each offering, the user can get maximum value for filter dollar spent with relation to intended use. Bulk media rolls are offered in selected slit widths with roll lengths determined by manufacturing processes. Pre-cut pads, as the name implies, are pads of filtration media cut to standard filter face sizes or to your desired custom sizes.